Mission: The Missouri Sentencing Advisory Commission, in carrying out its statutory duties under section 558.019.6 (2) (4), works to recommend sentencing that will provide protection for society; promote certainty, consistency, and proportionality of punishment; recognize the impact of crime on victims, and encourage rational use of correctional resources consistent with public safety. Function: The Missouri Sentencing Advisory Commission studies sentencing practices in the circuit courts throughout the state for the purpose of determining whether and to what extent disparities exist among the various circuits with respect to the length of sentences imposed and the use of probation for defendants convicted of the same or similar crimes and with similar criminal histories. The commission established a system of recommended sentences for each felony committed under the laws of the state. Member Requirements: One member will be appointed by the speaker of the house. One member will be appointed by the president pro tem of the senate. One member will be the director of the department of corrections. 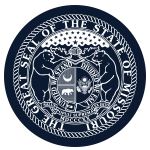 Six members appointed by the Governor must represent the Public Defender Commission, two private citizens, a private member of the Missouri Bar, the Board of Probation and Parole, and a prosecutor. Two members will be appointed by the supreme court, one from a metropolitan area and one from a rural area.